I'm going a bit stir crazy. It's dark, it's cold and there's not much else to do..besides complain about it. Well sure, I could start sorting and going through all our stuff to make things easier on myself later, but did I mention that it's cold and dark? 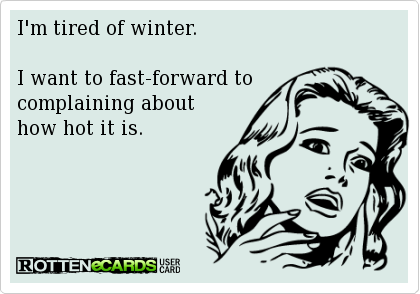 Plus my Seasonal Affective Disorder is in full swing, so it can wait. Of course the arrival of our Black Friday/Cyber Monday purchases doesn't help either. We've got brand new gear just sitting around begging to be taken out of their boxes and put on the boat. But like us, they have to wait too. Bummer. As if we didn't have enough to whine about already (*wink*), we'll also have items from Christmas that will soon need to be added to our gear pile, so until Spring we'll just have to keep complaining about all the fun boat stuff we have occupying our small home. For real though, complaining is one of my pet peeves (kinda like the term 'pet peeve') so if you don't buy into my serious, heart felt complaints above maybe you'll enjoy this clip; something that Ron and I like to say to each other when one of us bellyaches a little too much. For the record, I won't be the one complaining about the heat, that would be Ron's department.